1. What is the President up to? We are starting many new exciting directions and projects in the CNPS so, hang on to your hats! I want to especially thank someone who has put in more hours than any member or director in the CNPS: Bruce Nappi. Bruce is a tireless organizer with a ton of experience organizing groups as evidenced by the incredible organization of the CNPS forum (http://forum.naturalphilosophy.org). Beside the forum, many of the projects here are of his making. Bruce and I (David) have been collaborating and merging our ideas and directions into something that we feel will grow much wanted attention to the CNPS and its scientists. 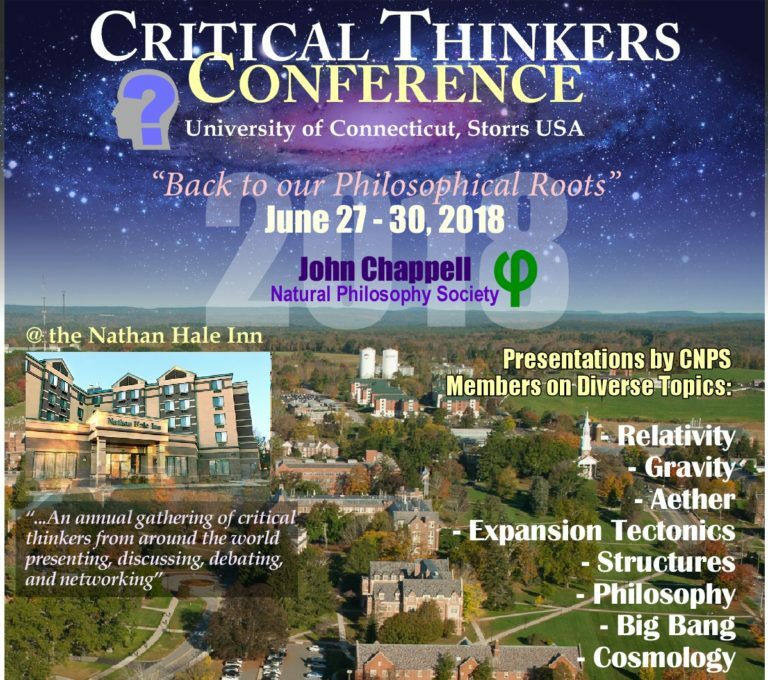 I have just signed a contract for CNPS 2018 to be held at the campus of the University of Connecticut – a sort of homecoming. I have included a preliminary poster for the event below. The date is fixed. We will be announcing the official Proceedings before the year is out so start working on your ideas for papers. Although last year’s conference in Vancouver was small, the quality of papers and presentations were at a high level and conference goers really got a lot out of participation. Some of those, like the talk from Musa Abdullahi, could be considered scientific breakthrough material. In his presentation about energy release from orbiting electrons, he presented clarifications for false but widely believed mainstream concepts. His simple proof showed how electrons can orbit and not emit energy, in full agreement with Maxwell’s equations. It’s time we brought such new views to the world. While I used the word “breakthrough” for Musa’s paper, such ideas are not unusual for CNPS members. In fact, they are probably the norm rather than the exception. From the beginning, CNPS was not formed as a one conference, one event per year effort. We are a 24/7/365 international society. Over the last year, there has been a lot of work done behind the scenes to put an infrastructure in place to empower the 24/7 efforts of our members. It’s now time to open our insights and discoveries to a much larger audience. This Newsletter will be longer than most. It will describe the visions behind what has been done and open full communications between members to apply all the new tools. I am looking forward to seeing and being part of the new awakening of CNPS. Hello all. Welcome to a new Newsletter format. A sneak peek at our new upcoming website that is totally geared toward “marketing” the CNPS – something we badly need to grow to the next level. This new Newsletter format is being introduced to accompany the successful launch of the new CNPS Forum and a new CNPS website planned for early in 2018. 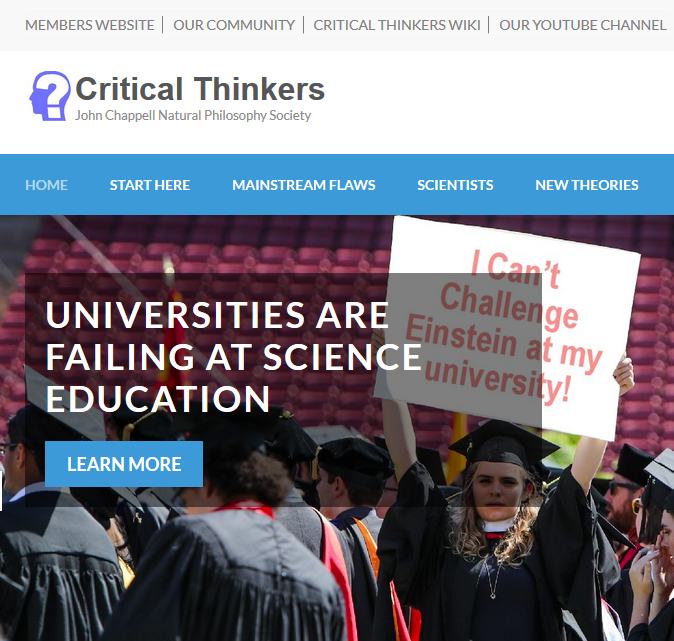 But in addition to our new focus on CRITICAL THINKING, the new Forum, and new website with new graphics and layout, CNPS is also trying out a number of additional member features. “Hold on”, I’m sure you’re saying! “It’s already impossible to keep up with all the things going on as is.” The Directors are well aware of that. So, practicing what we preach, part of the new push has been to apply critical thinking approaches to solve the overall information overload problem. The Newsletter format itself has been designed to be one of the key tools to do that. Each of these sections will have a short description which introduces the purpose of the section. While this seems like a long list, each issue will have the same sections. Once members start to get used to this layout, they can quickly jump to sections of interest and skip over the others. But, there is a much more powerful key innovation related to this Newsletter structure. The structure, along with section 9 of the Forum, make the Newsletter a two-way communication tool, not just a publication. Most of the Newsletter sections have a directly linked section in the Forum! No more “letters to the editor” needed. Just open the “CNPS Newsletter ” forum of the 9. CNPS Work Groups category of the Forum. That’s your “open line” to the editorial desk. Since a guiding policy of the Newsletter is to be inclusive of member inputs and opinions, if you have something to say, the Newsletter will do as much as possible to communicate your views to the membership. The Newsletter is initially planned to be a monthly publication. This will be adjusted based on how much activity there is and publication support from the members. Information about member participation will be included in each Newsletter section as well as in the related Forum sections. SO! With OPEN MINDS, but CRITICAL THINKING TURNED ON, enjoy being part of the new process. Closing matter – contact info, submissions, CNPS policies etc. This section is where to look for special messages from the Directors if there are any. 5. What’s New; What’s HOT? This section lists NEW items that may be of special interest to members and focuses attention on special HOT items that are discussed in the following sections. All members are encouraged to submit suggestions. To do so, look for “CNPS Newsletter” in the “9. CNPS Work Groups” category of the Forum and the What’s New; What’s HOT? thread. As an outreach and membership growth effort, starting with the publication of the current issue of this Newsletter, CNPS will be opening Forum access, for 6 months, for both reading and writing, to ALL 1100+ names on the distribution list for the CNPS Newsletter. See sections 8 and 12 of this Newsletter for details. 5c. Three CNPS YouTubers and Counting! The CNPS now has 3 active YouTubers: Robert de Hilster (http://youtube.particle.guru), Nick Percival (http://youtube.nickoftime.guru), and David de Hilster (http://youtube.dissidentscience.com). David who started first in May of 2017, has almost 250 subscribers and almost 20,000 views of his videos on his channel which is growing quite nicely. Robert and Nick have almost 50 subscribers and almost 1000 and 500 views respectively. They are now regularly producing their own videos. David has made a video on how to use OBS to do your YouTube channel. Contact him and he will help you set up everything you need for you to get your ideas out to the world! This section lists special awards, commendations and activities of members both as part of CNPS activities, and activities external to CNPS that are related to CNPS interests. All members are encouraged to make suggestions for these announcements. To do so, look for “CNPS Newsletter” in the “9. CNPS Work Groups” category of the Forum and the Special awards, commendations and activities thread. This section presents or references articles that present issues of high significance to members, or scientific summaries of breakthrough concepts that develop from CNPS member efforts. Most articles will be selected by the Newsletter editor or one of the Directors. All members are encouraged to make suggestions. To do so, look for “CNPS Newsletter” in the “9. CNPS Work Groups” category of the Forum and the Newsletter article submission recommendations thread. This section captures news on CNPS efforts with people and organizations outside of CNPS. For example, outreach programs might include other societies, colleges, universities, high schools, and the media. Activities could include collecting reference information, publishing CNPS member produced material, or providing speakers for scientific issues. Membership development would include special recruiting events. All members are encouraged to make suggestions and participate in these efforts. To do so, look for “CNPS Membership development and Outreach programs” in the “9. CNPS Work Groups” category of the Forum. As an outreach and membership growth effort, starting with the publication of the current issue of this Newsletter, CNPS will be opening CNPS Forum access, for 6 months, for both reading and writing, to ALL 1100+ names on the distribution list for the CNPS Newsletter. See section 12a for registration details. CNPS opens a channel for academics to present their own personal insights, outside the narrowly controlled “mainstream model”, for critique and support from peer level scientists and academics. CNPS provides a very simple approach to publication, in a context with other publications that push the boundaries of current knowledge and belief. Unlike conventional academic societies, CNPS membership costs are nominal – $35. While most members think the term “Conference” only applies to the annual CNPS conference, there are actually other types of conferences already underway. Additional conferences are also in planning. This section captures a summary of the status and any changes in conference activity. Arrangements have been firmed up to hold the 2018 CNPS Annual Conference at UCONN in Connecticut. More information will be posted as it is determined. Here is a summary of the most active year-round conference activity. It is hosted weekly throughout the year by Franklin Hu. Here is his description of this effort. For any questions, contact Franklin. What is Saturday Morning Videos? This is a 2 hour worldwide video web conference held on Fuze every Saturday morning at 7AM PST (10AM EST). These conferences can found by going to the URL: http://fuze.me/35925732 at the conference time. The same link is used for all conferences. When a member opens this URL, they enable a user panel that lets them observe a keynote presentation and directly communicate with the presenter and other participants. The presentation may include videos as well. What kind of things do we talk about? We openly discuss member’s theories, recent events in science, and generally discuss topics which are not well explained by the mainstream. Here are some examples of recent keynote topics: Gravity, Magnetic fields, Unipolar generators, Protons and electrons, Hollow earth, The basic structure of space, Expansion Tectonics and cold fusion as the source of increasing matter, Atom electron structure, The nucleus. How many participants do we typically get? We typically get between 9-15 participants from around the world. Who can access it as a participant? Anyone with access to a computer that can run the Fuze software can participate. If a computer or internet connection won’t support the software, the participant can dial in at +12014794595 . The meeting and the topic is announced to all CNPS members by email, but anyone is free to join. Accessing the conference at a later time to audit it? The Project Status section summarizes the status of special projects of interest to CNPS members that have been chosen and given special attention by CNPS as an organization. This effort acknowledges two fundamental principles of CNPS as a society. First, CNPS is much more than just a common identifier members use to just identify a special interest relationship we share. It is also more than a once-a year activity called the annual conference. As a “Society”, it represents the combined energy of hundreds of members and affiliates who work together for mutual support. Second, because we have communication tools that provide almost instantaneous worldwide interaction, we have the ability to conduct a continuous effort that involves all the members, that is active throughout the entire year, not only at the annual conference. What is a CNPS Project? 1. Identify a project that addresses a scientific issue of high importance to a broad section of the membership. 2. Create a true academic Project to address the issue. 3. Select narrow project goals, conduct problem definitions, literature research, and mathematical, physics and empirical studies to address the problems. 4. Write scientific papers and Critical Wiki’s to present the findings. How will a project be conducted? 1. The members of the CNPS Board will take the pulse of the membership to determine member interest. This will identify high interest topics. 2. A formal Project planning, organizing, staffing, implementing, documenting, and publishing protocol will be used as a guideline for conducting projects. 3. The project will have the following general staffing breakdown: project coordinator, project facilitators, lead scientists, research teams, publication teams. 4. The project will be open to ALL CNPS members who offer their support, and participate in a professional manner. Special participation will be offered to CNPS affiliates, students, and appropriate members of societies that share CNPS principles as Forum “Guest Scholars”. 5. The primary platform for the project will be the new CNPS Forum, using the Structured Discussion approach. (This approach is described in the introductory section of the Forum). 6. Coordination of the project will be done in special sections for the discussion. 7. A running status report will be posted in the forum that shows: a. what the project is all about – its goals, challenges etc. ; b. what has gone on so far (discussion summary); c. what issues have been resolved and what breakthrough conclusions have come up; d. what issues are hot; e. what stumbling blocks to resolution need to be addressed; etc. 8. A summary status report for all active projects will be posted in the Project Status section of both the Forum and the Newsletter. 9. As the project reaches milestones, periodic papers and Critical Wiki’s will be written and published. A CNPS Peer Review process will be developed and conducted for these papers. 10. ALL members and Guest Scholars who make significant contributions to the effort will be listed for their roles in the publications. GPS and the Speed of Light is a formal Project of CNPS to collect, organize, and publish the best current scientific concepts from CNPS members related to the physics of the Speed of Light. Bruce Nappi gave a presentation at The 2017 Annual CNPS Conference titled: Improving CNPS Effectiveness Through Structured Communication – Year 2 This presentation discussed a 6 month effort that studied an email discussion which involved CNPS members, but was not a formal part of CNPS. 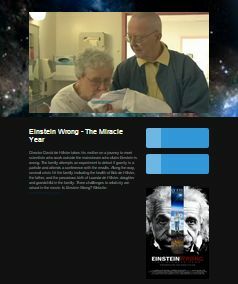 One of the conclusions characterizing the discussion was that over 60% of the posts, which covered 194 topics during the study period, related to Special Relativity, and specifically, the speed of light. So with this strong CNPS wide interest, the speed of light (radio waves) has been chose for Project 1. 1. The PRIMARY goal of the project is to summarize and evaluate the observation that signal timing data from the GPS program does NOT confirm the observer determined speed of light postulate that Einstein used to develop Special Relativity. The GPS data will be evaluated against the 3 major theories of electromagnetic wave propagation hoping to advance the understanding of these 3 major theories. 2. A Structured Forum, category 1.1, has been established on the CNPS Forum to conduct this project. Project details and tracking are shown there. 3. The project Facilitator will be Bruce Nappi. Ron Hatch has agreed to be Chief Scientist for the program. Three physics Model Development Leaders will be sought to lead the model-specific geometry development. Matthias Grabiak has agreed to lead the Relativity team. Additional society members can join tasks where needed. ALL those contributing to the effort will be acknowledged appropriately in the published material. 4. CNPS member experts, representing all 3 currently postulated light speed models – source, medium, observer – will develop 3 model-consensus geometries, one for each model. 5. Primary and secondary reference material needs to be gathered to support ALL 3 model positions. Reference material for the GPS data needs to be gathered and annotated. 6. Theoretical tests shall be developed, using the consensus geometries for the GPS geometry, that are able to discriminate which of the 3 consensus models are supported by the GPS data. 7. The tests shall be run using the GPS data. 8. The results of the tests shall be documented in one or more publishable papers, which shall be subject to peer review. 9. The papers will be published. 10. Critical Wiki articles, CNPS blogs, articles and videos will be generated from the papers. 1.2 Expansion Tectonics – 2018 is a formal Project of CNPS to support Dr. James Maxlow’s decades long research. The project will collect, organize, and publish his best current scientific understanding of the data on Global Tectonics. James Maxlow was given a CNPS Lifetime Achievement Award at the 2017 Annual CNPS Conference for his work on Expansion Tectonics. He presented a summary of his decades long work titled: Expansion Tectonics Its Implications for Physics. 1. The PRIMARY goal of the project is to summarize the observations of Expansion Tectonics that suggest the earth was once quite a bit smaller than it is now, and is currently undergoing rapid size expansion. These observations will then be presented in numerous tabular and graphic forms in comparison to alternative concepts. 2. Last year, a Structured Forum category was already established to start the project, and preliminary activities have been completed. Project details and tracking are shown in the Structured section of that Forum (6.2 Expansion Tectonics). 3. The project Facilitators are Lloyd Kinder and Bruce Nappi. James Maxlow has agreed to be Chief Scientist for the project. Society members can join tasks where needed. ALL those contributing to the effort will be acknowledged appropriately in the published material. 4. The field of global tectonics is currently dominated by 6 theories: Expansion Tectonics, Plate Tectonics, Surge Tectonics, Electric Universe, Electrostatic Universe and Shock Dynamics. 5. Primary and secondary reference material needs to be gathered to describe ALL 6 model positions. 6. Theoretical tests shall be developed which discriminate the value of one theory over another. 7. The tests shall be run using the available data. 1.3 Relational Mechanics is a formal Project of CNPS to explore physics alternatives to Newton and Maxwell. 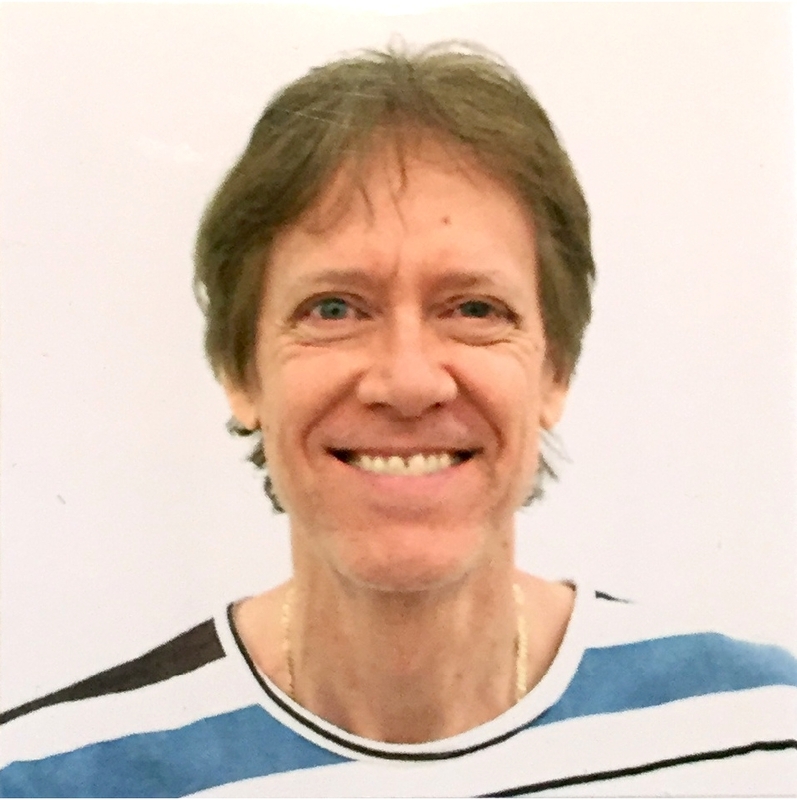 The project will collect, organize, and publish a review of alternative physics models, drawing primarily on the work of CNPS member Professor Andre Assis, currently professor of physics at the University of Campinas in Brazil. 1. The PRIMARY goal of the project is to summarize the basis and methods of Relational Mechanics. These observations will then be presented in numerous tabular and graphic forms, comparing it to alternative concepts, showing its strengths and weaknesses. 2. A Special Project 1.3 Relational Mechanics is being created to conduct this project. Project details and tracking will be shown in that forum. 3. The project Facilitator is Bruce Nappi. David deHilster has agreed to be Chief Scientist for the project. Scientific support for Relational Mechanics will be provided by Professor Andre Assis. Society members can join tasks where needed. ALL those contributing to the effort will be acknowledged appropriately in the published material. 4. Primary and secondary reference material needs to be gathered to describe current and past foundational models for physics. 5. This project, like most others at CNPS, will be conducted as scientific research. A series of theoretical examples will be developed to show why each foundational model was developed to explain some observation of nature. Where “mainstream” examples are challenged by CNPS members, additional examples will be created to explain the challenges. 6. The results of the analysis shall be documented in one or more publishable papers, which shall be subject to peer review. 7. The papers will be published. 8. Critical Wiki articles, CNPS blogs, articles and videos will be generated from the papers. All 3 of these projects need volunteers at all levels. So, go to section 1.0 of the Forum and find out how you can participate. ALL participants will be credited for their efforts in the publications. This section will capture updates for the development of the new website. This section captures highlights from the most active and productive forums in the CNPS Forum and special efforts going on with the forum. The Forum can be found at: http://forums.naturalphilosophy.org. As an outreach and membership growth effort, starting with the publication of the current issue of this Newsletter and continuing for 6 months until June 1, 2018, CNPS will be opening Forum access for both reading and writing to ALL 1100+ names on the distribution list for the CNPS Newsletter. For friends of Newsletter readers, or those who get the Newsletter from a registered reader, you can also participate in the program by signing up for the free Newsletter at: http://www.naturalphilosophy.org . Look for a grey box at the top of the right panel that says, “Subscribe to our Newsletter”. By offering this service at no cost for a limited time, those interested can experience most of the features of CNPS without having to become a full member. If you like what you find, please go to the CNPS home page and join. Membership fees are nominal. Register using your natural name. This is the preferred way. It allows a more personal interaction with CNPS members and other Guest Scholars because it allows the inclusion of your academic and public backgrounds to be shared. For example, a person with extensive publications for a topic can reference those in discussions. Register using an alias. CNPS is well aware of the social and professional pressure put on academics for presenting views that go “too far” outside mainstream dogma. To respect this limitation, a person can register using an alias name and an alias identity email address. Special steps are required, however, to prevent use of this approach by bots and Trolls. Open: http://forums.naturalphilosophy.org/ You should see a black rectangle at top left that says Natural Philosophers Forums. If it says Natural Philosophers Community in a black banner that goes all the way across the screen, you somehow got to the old forum which is no longer active. This will get you to the registration page. The account preferences are preset with typical entries. You can change these if you want during registration or anytime later using a member Control Panel (CP). The Forum has a lot of customizable features which are explained in user guides on the Forum. There is one important feature that can be set during registration: “Default Thread Subscription Mode”. This feature sets how you want to be notified of activity going on in topics you are interested in. Unlike email discussions, you have a choice. For each topic you are interested in, this setting controls if and how you will be notified when a post is made to the topic. Set your time zone. CNPS has members from around the world. “DST” means Daylight Savings Time corrections. When you submit the registration, the program will send a message to the email address you entered to verify the registration was not made by a robot. Reply to that message. The program will then send a message to a Forum administrator asking to activate you. That will be done as quickly as possible. Your name will be verified against the Newsletter distribution list. A “Welcome” letter will be sent to you. You can then log in. Your user name will be set to First-name space Last-name. The “Guest Scholar” flag you entered will be removed. I’m sorry this is a little complex. But we have already been hit by multiple spam attacks. The forum is open to any live human (in good standing – i.e. no Trolls) as Guests for READING only. Only full CNPS members and Guest Scholars in good standing can post threads and replies. A registration agreement will open. Read it. If you agree with it, then click “I Agree” below the agreement. When you submit the registration, the program will send a message to the email address you entered to verify the registration was not made by a robot. Reply to that message from the email address entered in step 7 above. The program will then send a message to a Forum administrator asking to activate you. That will be done as quickly as possible. Your name will be verified against the Newsletter distribution list. A confirming verification letter will be sent to the email address provided in step 7. At this point, we require that you send us a reply to the verification letter that includes your real name. An appropriate place will be specified in the verification letter. This reply should be sent from an email address associated with your real name. Both your real name and your name associated email address WILL NOT be made visible on the Forum or be accessible from the Forum. They will be held in a confidential secure location by separate software for the sole purpose of screening out fraudulent bot and Troll registrations. When the verification letter is received, a “Welcome” letter will be sent to your name associated email. You can then log in. Your user name will be set to the alias name used for registration. The “Guest Scholar-A” flag you entered will be removed. I’m sorry this is so complex. But we have already been hit by multiple spam attacks. The Forum is open to any live human (in good standing – i.e. no Trolls) as Guests for READING only. Only full CNPS members and Guest Scholars in good standing can post threads and replies. This section will provide a summary of all CNPS Critical Wiki’s being developed, and their status. It also lists recent member publications, including those published on the CNPS website and externally. All members are encouraged to provide citations for these announcements. To do so, look for the “9. CNPS Work Groups” category of the Forum, the “Wiki Working Group” and the “CNPS Newsletter Member Publications” thread. CNPS provides numerous capabilities for members to directly publish material. Each member can have their own blog. This allows them to post comments and short articles and have discussions about their posts with readers. This section will summarize current activities for Blogs, videos and Facebook. When there are special articles in the Newsletter which cite references, those references will be repeated here for reference. 16. Closing matter – contact info, submissions, CNPS policies etc. To comment on any of the sections of this Newsletter, for those readers who are CNPS members or Guest Scholars, go to the CNPS Forum and look for category 9. CNPS Work Groups CNPS Newsletter There are multiple threads in that forum that deal with different sections of the Newsletter. Submissions for the Newsletter are only accepted from CNPS members or Guest Scholars. There are no set time limits on submissions. Submissions will be used, when accepted by the Newsletter editor, on a time available basis. Submissions shall be made through Forum category 9. CNPS Work Groups CNPS Newsletter . The Newsletter does NOT accept any advertising. For any special situations, contact the editor. User-Generated Content. Much of the writing of articles in the Newsletter is done by members or special guests. When submitting User-Generated Content, submitters have agreed to abide by the Code of Conduct described in the CNPS Forum registration agreement and on the CNPS website. CNPS does not claim ownership of content submitted. Submitters own and have rights to use the User-Generated Content. Therefore, submitters are also fully responsible for the User-Generated Content they submit. 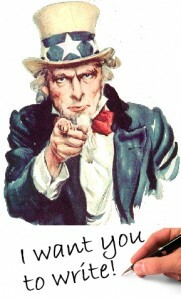 However, by submitting User-Generated Content, the submitter grants to CNPS a perpetual, non-exclusive, fully paid and royalty-free, transferable, sub-licensable, worldwide license to use, download, duplicate, display, distribute, modify and create derivative works of the User-Generated Content, unless a specific, written, mutually acceptable agreement is established otherwise. Founder/Director of the A3 Research Institute, the A3 Society, the Humanist Friendship Group of New England. Co-founder of the School of the Medical Arts, the first all medical high school in the U.S. Eagle Scout on the 1965 North Pole Expedition.